As you remember, the Missouri Firearms Coalition recently conducted a gun giveaway for everyone who signed our petition calling for the end of deadly ‘Gun Free Zones’ here in Missouri. Thousands of Missourians signed this petition, demonstrating the broad grassroots support that this legislation clearly enjoys! I’m pleased to announce that Linda Zeiters, from Springfield, won an incredible Sig P229 from the Missouri Firearms Coalition! This pistol is valued at over $750 and is the same pistol used by the United States Secret Service to defend President Trump and his family. 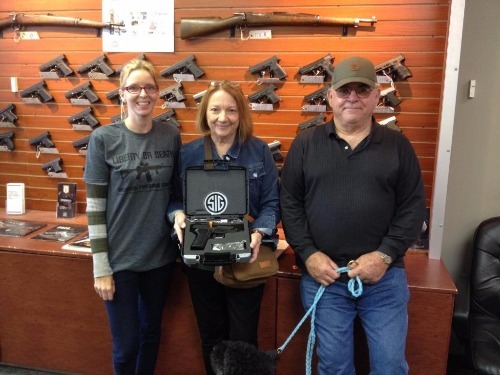 Recently our Political Director, Alexandra Salsman, had the opportunity to meet with Linda and her husband as they took possession of this awesome pistol! I want to thank each of you who signed your petition — whether online or in the mail — calling on the legislature to pass our bill to end deadly ‘Gun Free Zones’ next session! You may recall that last session this legislation made it through THREE House Committees before being tabled by the House leadership team. 2018 is an election year. The entire House and half of the Senate are up for re-election. And before they come asking for your money, volunteer time, and votes next fall –- we need to insist that they pass this legislation! We’ve made a lot of progress in advancing our Second Amendment freedoms in the last two years, but we can’t let up now. Gun rights is all about momentum, and I’m counting on you to help us keep the ball rolling here in Missouri. So if you’ve not already signed our petition calling on the legislature to pass this badly needed legislation in 2018 -– please do so right away! And then I hope you’ll forward this email to your friends and family, and encourage them to sign the petition and get involved in this fight, too! And please join me in congratulating Linda Zeiters and her husband on winning this great handgun! P.S. Linda Zeiters and her husband are the proud owners of a new Sig P229, as they are the winners of our recent gun giveaway program! This was done as part of our efforts to collect as many petitions as possible before the start of the 2018 session, during which we hope to end deadly ‘Gun Free Zones’ here in Missouri! So please take a moment to sign your petition in support of this bill. Next year is an election year, meaning that your grassroots activism will be magnified as your legislators know they need to deliver the goods before asking for the help of gun owners in their reelection campaigns. Help us crank up the heat in Jeff City, by joining the MOFC today!